I’m about to get on a plane back to warm Phoenix (I don’t know how you people live with freezing temperatures), and I’m trying to get back on top of my email/rss feeds. I did see that Google created a new category in the table of contents called “Geographic Web” in Google Earth (and turned on by default). The name is a very poor choice, but that is a topic for another day. I’ll admit I never use Panoramio, so this was the first time I’ve seen the logo in months but I did notice that it looked very similar to another logo out there. Panoramio updated their logo back in October so I’m not sure what the logo looked like before as I can’t find it. Now this could all be a coincidence as the process of developing the logo seems innocuous. 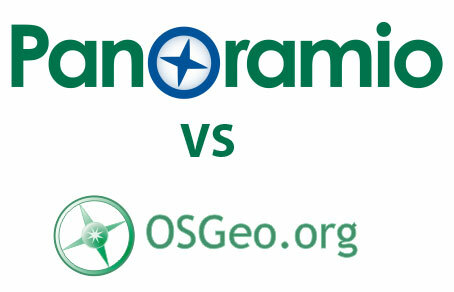 One might say it is natural to have a compass with a “geo” site, but the similarity has to make some in the open source community a little disappointed. Of course this is the second time Google Earth has been involved with using a logo similar to OSGeo so maybe deep down everyone just loves it. Update - There is a similar discussion on Geowanking.